Sign for the ruby mine in Montepuez. Photo by Tomás Queface. Used with permission. Videos published on social media by the investigative journalist Lázaro Mabunda  documented scenes of torture, allegedly at a ruby mine in Namanhumbir, a northern city in Mozambique’s Cabo Delgado  province. Globally, Namanhumbir  rubies are traded in large auctions generating millions of dollars. In 2016, the company Gemfields, headquartered in London, announced that the sixth auction of rubies extracted from the Montepuez district in the Cabo Delgado province, returned a record $44.3 million (USD). In April this year, the newspaper Notícias  reported that nearly four thousand miners — both nationals and foreigners– were expelled from ruby and garnet mines in Namanhumbir, as part of operations by the Defence and Security Forces (FDS) aimed at tackling illegal mining in that part of Cabo Delgado province. 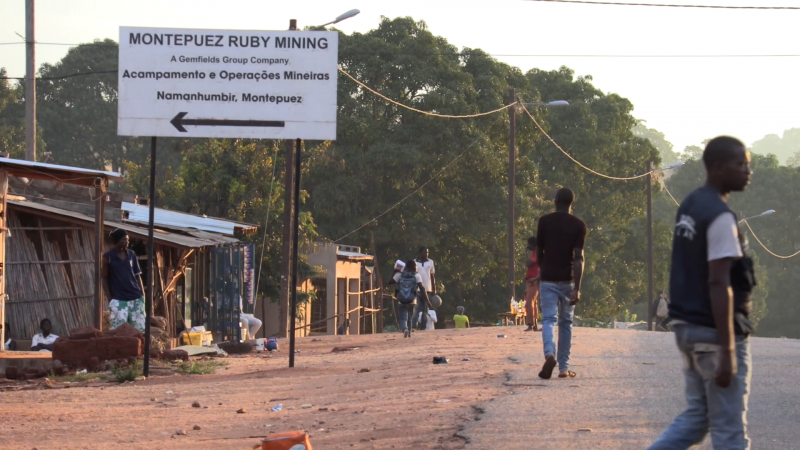 Reports by Rádio Moçambique  tell of a warlike atmosphere in the ruby mine caused by disputes between the land grant holder Montepuez Ruby Mining Ltd, and illegal miners — a group which includes foreign nationals — who intend to continue mining the precious stones illegally at the expense of the state of Mozambique. These illegal miners mostly come from Tanzania, Senegal, and Somalia, alongside Mozambicans from the provinces of Nampula and Niassa. In the images shared on social media and flagged by Facebook as sensitive, it is obvious that the torture and violence the miners were subjected to in the ruby mines of Namanhumbir, are quite serious. Consta que isto está a acontecer em Namanhumbir, na mina de Rubis. Dramático. Tratamento desumano aos garimpeiros. A ser verdade isto algo deve ser feito. Os autores devem ser responsabilizados. It is reported that this is happening in Namanhumbir, in the ruby mine. Dramatic. Inhuman treatment of miners. If this is true something must be done. The perpetrators must be held responsible. Lamentável! Questiono a seleção dos candidatos à formação da polícia e até aos próprios formadores se aprendem o que são direitos humanos? Quais os critérios para a seleção dos candidatos à formação da polícia? Terrible! I question the selection of the candidates for police training and even to the trainers if they learn what human rights are? What are the criteria for the selections of candidates for police training? Esta mina tem como accionistas, gente grauda deste país, e Samora Machel Jr., é director, será que a justiça vai funcionar? Vou esperar sentado praia não ter caimbras. This mine has important people of this country as shareholders, and Samora Machel Jr. is director, will the courts work? I’ll wait on the beach not having cramps. Triste eu nasci e cresci acreditando que escravidão era algo dos séculos passados, mas não isso ainda está a predominar da pior maneira irmão aceitando o outro. Sad, I was born and raised believing that slavery was something from centuries past, but no, this is still predominant in the worst way brother accepting another. Esses homens fardados, devem ser severamente responsabilizados pelos actos desumanos que estão cometendo contra cidadãos na sua própria terra e seus próprios recursos. Deve ser urgente a intervenção do Ministério Publico. These uniformed men must be held strictly responsible for the inhuman acts that are being committed against citizens in their land and among their own resources. The action of the Public Prosecutor must be urgent. In an interview with the news website DW Português , the president of the National Commission of Human Rights, Custódio Duma, said that Mozambique’s image was once again tarnished in this episode..
São imagens chocantes. Independentemente das irregularidades que os garimpeiros poderão ter cometido, aquele tipo de atitudes são hoje condenáveis. Não se percebe [estas atitudes], em pleno século XXI. A polícia devia ter agido de outra forma: independentemente da situação que aconteceu no local aquele não é o tratamento que se deve dar àqueles cidadãos. They are shocking images. Regardless of the irregularities that the miners may have committed, that type of attitude is now reprehensible. We cannot see [these attitudes] in the 21st century. The police should have acted differently: regardless of the situation that unfolded there that is not the treatment which should be given to those citizens. Uma das melhores formas que se podia fazer [para fazer face a este tipo de casos] é questionar o ministro da Justiça e Assuntos Constitucionais, tendo em consideração que a revisão periódica da legislação recomenda algumas medidas para diminuir o uso excessivo da força. https://t.co/Wr3GGwtAX7  @welltraveledfox  @ChyemennSantos  Confirmed, Namanhumbir is in Mozambique nothern province, Cabo Delgado.